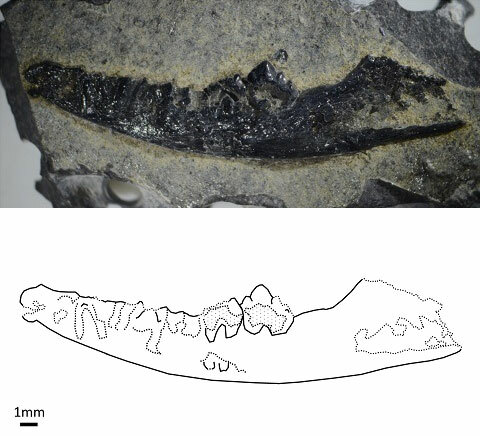 This week, a new paper came out about a fossil mammal from the Isle of Skye. It was my first scientific paper (first of many!) with my colleagues, Dr Stig Walsh (Senior Curator of Vertebrate Palaeobiology at National Museums Scotland) and Dr Roger Benson (University of Oxford). We described a lower jaw found during our ongoing palaeontological fieldwork on the Isle of Skye, Scotland. What’s so special about this little fossil, is that it provides the first evidence for mammalian milk-production in the Scottish fossil record. Reconstruction of Wareolestes rex © Elsa Panciroli. Our fossil Wareolestes jaw is from the Kilmaluag Formation, a Middle Jurassic aged rock formation found in the Inner Hebrides. The Middle Jurassic was an important time for most major groups of animals (including the dinosaurs), and mammals were no exception. Unfortunately for palaeontologists, globally there are very few places with fossiliferous Middle Jurassic rocks. This makes the sediments of Skye internationally important. The environment on Skye in the Middle Jurassic was quite different from today. Mainland Scotland was an island in a semi-tropical sea, and Skye was sandwiched between it and the islands to the west (today’s Outer Hebrides). 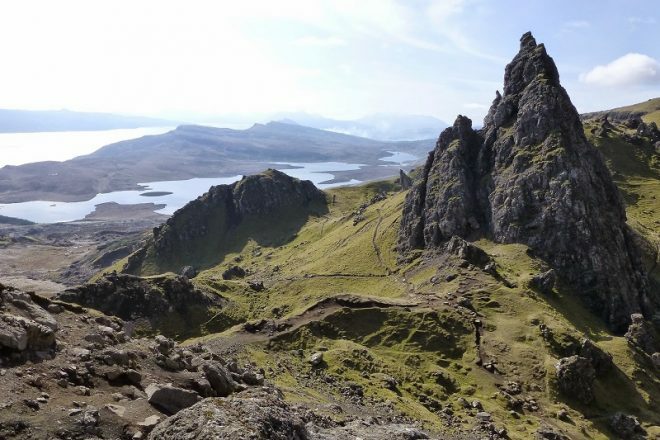 Over millions of years, Skye lifted and fell due to geological activity, periodically flooding the area to form a shallow seaway filled with fish and marine reptiles (such as the ‘Storr Lochs Monster‘), then rising again to form a landscape peppered with lagoons. These lagoons were populated by crocodiles, turtles and lots of small vertebrate animals such a salamanders – and mammals. It was in this environment that our Wareolestes lived and died. We call mammals from this time Mesozoic mammals (after the Mesozoic time period, which includes the Triassic, Jurassic and Cretaceous). The fossil lower jaw, or dentary, tells us Wareolestes was a relatively large Mesozoic mammal, around the size of a guinea pig. Most mammals at this time were smaller than this. The really amazing thing about our fossil is that it retains replacement teeth inside the jaw. Although the jaw is only 2cm long, using microCT scanning we could digitally reconstruct it and peer deep inside the bone. This revealed the adult teeth sitting just below the gum line, ready to erupt. Our Wareolestes was a sub-adult, meaning it was on the cusp of adulthood. If it had been just a few weeks younger or older, we wouldn’t have seen this crucial transitional stage of its life-cycle. No other animal group replaces teeth in the way that mammals do. Because mammals’ teeth are specialised for food processing – with incisors, canines, premolars and molars – the teeth must meet precisely for biting and chewing to be effective. Most reptiles, in contrast, replace their teeth randomly, and they get bigger throughout their lifetime. But in mammals, there is a set of ‘milk’ teeth while the animal suckles and grows quickly, followed by a set of adult teeth to allow them to chew adult foodstuff. Finding this set of replacement teeth in Wareolestes rex tells us that this little mammal from the Jurassic had a modern mammal replacement pattern, and so it probably suckled on milk when young, and grew quickly. 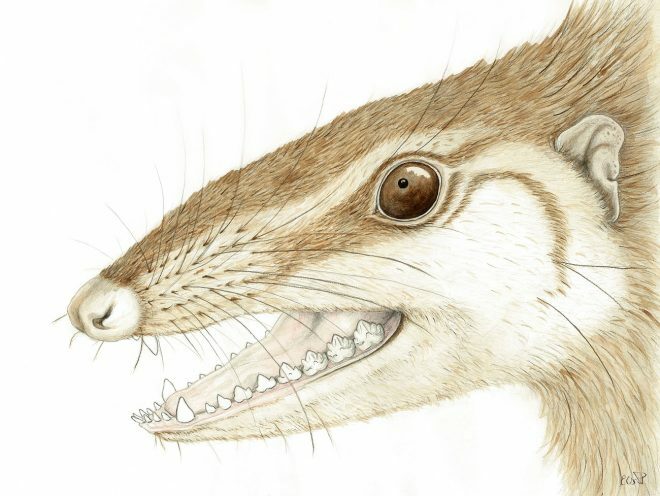 This is the first time evidence for Mesozoic mammal tooth replacement has been found in Scotland. Wareolestes was previously only known from a few single teeth found in sediments in England. There was disagreement about whether the first Wareolestes rex tooth was an upper or lower tooth, and whether it was from the left or right of the mouth. Our Scottish fossil puts this to rest. By comparing the teeth, we can say the original tooth from England was a lower left molar. There are still many fossils to be described from our trips to Skye, and the work continues this month with two trips funded by National Geographic. There are undoubtedly many more secrets to be revealed in these rocks. This is really fascinating. Thank you for sharing. Which other early mammals from Scotland have been described so far ?